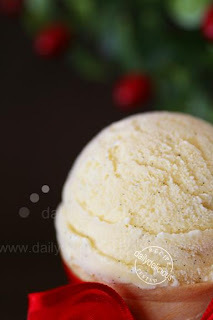 dailydelicious: French Vanilla Ice Cream: Lighter way to enjoy delicious real ice cream! 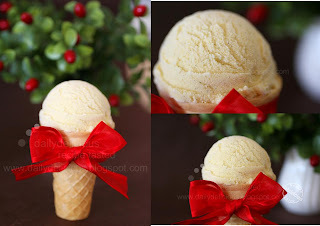 French Vanilla Ice Cream: Lighter way to enjoy delicious real ice cream! The vanilla flavor is like a basic ice cream that you can find everywhere so there are many people who don't understand why we (I know that you make it, too ^ ^) bother to make it at home. 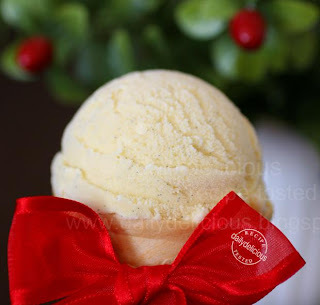 But for us the vanilla ice cream is both simple and sophisticate and when making at home there are many factors that you can control and make it better (and delicious!). Today I choose the French vanilla ice cream. The different between this recipe and other recipes is the amount of the milk, this recipe will be lighter because the cream is less (most of the recipe calls for equal amount of the milk and cream, but this one, the milk is the double quantity of the cream). So, you can eat a lot of it and still feel fine (^ ^, yes, I love this feeling, when eating a lot but feeling like there are a lot of space left, haha). It will be great if you can find the Madagascar Bourbon, but other vanilla bean will be good too, (or it's up to you if you love other kind of vanilla use it, it's your ice cream anyway, haha). 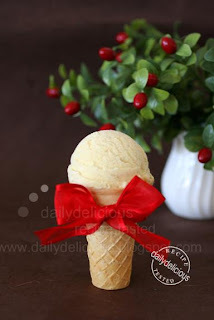 The little black vanilla bean brings this ice cream its charm, and the fragrance of the ice cream is over the top (well, you will know the difference between the real vanilla ice cream and the commercial one). The corn syrup is added to make the texture of the ice cream easier to scoop, but if you don't have it but want to make this ice cream, just use the 30g of the sugar instead. 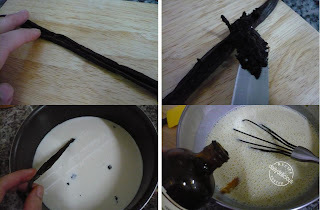 Split vanilla bean in half with a knife and remove seeds. Place the seeds and vanilla bean pod in a medium-size, heavy-bottomed saucepan. Add the milk, corn syrup and 25g of the sugar. Stir to combine. Place over medium heat and cook, stirring occasionally, until the mixture registers 170°F (77°C) on an instant-read thermometer. Remove from the heat, cover, and let steep for ½ hour. Remove the vanilla bean pod and place the steeped mixture back on the stove top over medium heat. Warm, stirring occasionally to keep the bottom from scorching, until it registers 170°F (77°C) on an instant-read thermometer. In a nonreactive, medium-size bowl, whisk together the egg yolks and remaining 25 g of sugar until foamy and slightly thickened. 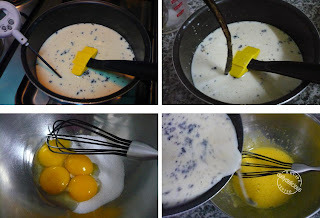 Carefully temper the egg yolks with the hot milk mixture by slowly adding about half of the hot liquid to the eggs, whisking continuously. Whisk the heated egg mixture into the saucepan with the hot milk and return to the stove top. Stirring continuously with a wooden spoon or heatproof rubber spatula, cook the mixture over medium heat until it registers 185°F (85°C) on an instant-read thermometer or is thick enough to coat the back of the spoon or spatula, making sure the mixture does not boil. Remove from the heat and emulsify the mix, if not completely smooth, before incorporating it into the cold cream. Pour the heavy cream into a clean, large stainless-steel or glass mixing bowl set over an ice bath. Pour the heated custard through a fine-mesh sieve or strainer into the cold cream, add the vanilla extract, and stir until fully incorporated. Stir occasionally (about every 5 minutes or so) until the mixture has fully cooled. This should take about ½ hour. Remove the mixing bowl from the ice bath, dry off the bottom of the bowl it necessary, cover with plastic wrap, and chill in the refrigerator for at least 8 hours or overnight. Remove the finished gelato from the ice-cream maker and place in a plastic container. Cover with plastic wrap by pressing the wrap gently against the top of the gelato, affix lid to container, and place in the freezer to fully harden before serving. I love it! I don't have to mess with some other things to make an ice cream! Thanks! 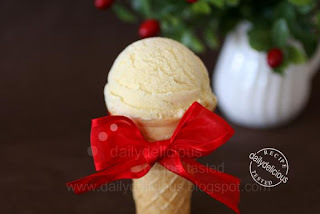 Your ice cream cone is very nice...especially with the ribbons. If I dont have the vanilla pod, how? Add more pure extract?